Terrific UK and Ireland Peering Forum in Dublin. Mostly attendees from the republic but plenty of people made the trip over from the UK. It was followed by the regular INEX meeting which had a superset of attendees – bit of a pun – they were all v nice – geddit. 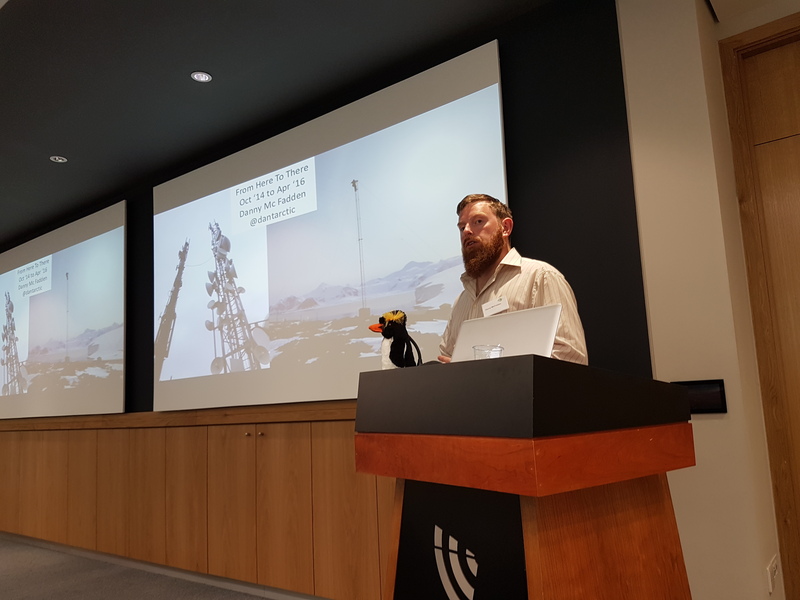 The day was closed by Danny McFadden (@dantartic) who spoke about his two year stint as IT manager of the British Antartic Survey base in Rothera which is on the sticking out bit. An interesting life experience. Rothera has recently upgraded its satellite internet connection to 1.5Mbps which costs them £150k pa. Next time you think of changing broadband suppliers and whinge about pricing just think of that. It is currently winter in Antartica and the bases are either closed or trimmed down to a skeleton staff of 18 or so persons. It was interesting to get an insight into the difficult nature of the live in wintertime and perpetual darkness. For example there was at the time of his talk, a medical emergency happening at the South Pole base. An American scientist was ill and needed emergency evacuation to hospital. This is harder than you think. Two planes had to fly in to Rothera. One then switched to skis and flew on to the pole. This is a ten hour flight in darkness. It was also a very expensive job. One barrel of fuel costs $1,000 by the time it has been transported to Rothera. To get it to the South Pole costs another $9,000. That’s a ten thousand dollar barrel of fuel. And the plane needs 5 of them to get from Rothera to the pole. So the return flight for one plane from the edge of Antartica to the pole cost $100,000 in fuel alone. Science is an expensive business. Governments support it because the Antartic treaty comes to an end in 2050 and countries want to maintain their presence as an investment towards the land grab/bun fight that is expected to happen at that time. It could spell disaster for Antartica because they are all interested in the mineral rights. A big thanks to INEX and especially Eileen for such a well organised event. The UK and Ireland Peering Forum is run by LONAP, INEX, LINX and IXLeeds (in no particular order of preference).